The Bluefin Tuna (thunnus thynnus) is the largest of the Scombridae family, of which there are 50 subspecies. Compared with the over 23,000 species of fish in the world, the Scombridae family is one of the smaller but well-known varieties. 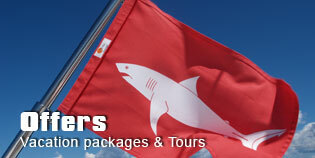 The best-known are the yellow fin- and big-eye-tuna, as well as the Albacore, Bonito, Wahoo and King Mackerel. The giant Bluefin Tuna is found in many parts of the world’s seas. That is why one usually speaks of Atlantic, southern or Pacific Bluefin Tuna. The Pacific type is found in the waters off Southern California and as far north as Alaska. The Atlantic type, which is the largest, is found in regions round Nova Scotia, Canada, and as far south as South America. Bluefin Tuna continue to be seen and caught off Norway and as far south as the north-west coast of Africa. The Bluefin Tuna, unlike its co-species, is very adaptable as regards its nourishment and water temperature. The Bluefin Tuna is a greedy feeder throughout its life. This excessive appetite is a considerable advantage. Similar to the Mako shark for example, the giant Bluefin Tuna can convert physical energy into warmth energy and store this in its body, which is evident from the arteries and veins which lie parallel to each other. Thus the body temperature of the Tuna is as much as 15C. warmer than most other fish of prey. 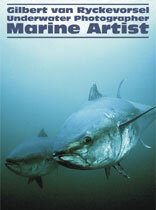 This, combined with streamlined form of the body, make the Bluefin Tuna a perfect hunter. Between June and Octoberr, the hunt for food is a daily activity. The type of prey, such as mackerel and herring with a high fat content, makes it possible for the fish to increase their body volume by 15 - 40% during this period. Tuna are very fast and long distance swimmers. The "normal" speed of about 3 - 6 mph can increase within seconds to 20 - 40 mph. and there are speeds of up to 55 mph recorded! As mentioned before, the Bluefin Tuna is very adaptable as far as its environment is concerned and is active in water temperatures of between 6 - 25C. Bluefin Tuna need a great deal of oxygen and cannot extract oxygen from the water by pumping, like some cold-blooded species of fish. Tuna extract oxygen from the water by means of a sort of pressure ventilation and that is why they must be constantly on the move. The gills contain very dense capillaries which have a surface area ten times greater than other cold-blooded species. 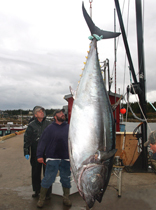 For many reasons Nova Scotia provides a perfect environment for the bluefin tuna. Nova Scotia was already internationally well-known at the beginning of the nineteenth century for the fishing of these fantastic fish. From 1930 until 1960 the "Sharp Cup" was held in Nova Scotia, during which for example in 1949 an amazing 1,760 fish were caught. 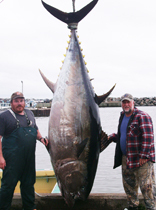 Until 1970 the giant bluefin tuna was purely a game fish and the market price per pound was 0.05ct. Can$. In the seventies, however, the Japanese fish market expanded rapidly. Because the bluefin tuna was ideal for sushi, Japanese fish importers pushed the price for Nova Scotia blue fin tuna right up to over 40.- Can $. per pound. 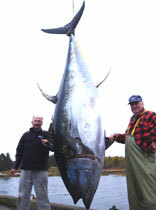 The highest price ever paid on the Japanese fish market for one bluefin tuna was an unbelievable 180,000 $. 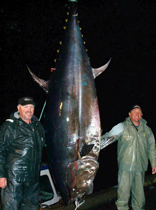 Bluefin tuna fishing has a long tradition on Nova Scotia and cannot be compared with any other type of fishing in the world. 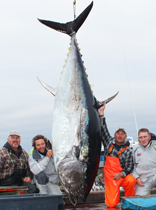 The population of giant bluefin tuna round Nova Scotia is incredible. There is probably nowhere comparable in the world where the fisherman has such a good chance of landing a gigantic blue fin tuna. Every year a number of fish weighing over 1000 pounds are caught, however the average weight is "only" between 400 and 600 pounds! 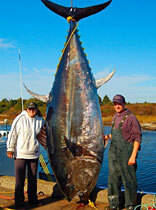 Nova Scotia holds the unbeaten world IGFA record of 1,496 pounds for a fish landed at Auld's Cove in 1979! Although Canadian professional fishermen have to earn their living partly by fishing tuna, I believe that none of them would be willing - even if the market prices were low - to give up fishing for blue fin. I know countless professional fishermen, in the third and fourth generation, who have caught very big fish - for example cod over 70 pounds, halibut from 350 - 400 pounds etc. They all agree that, compared to catching a blue fin, these catches are not worth mentioning. European fishermen tell of their great salmon catches in Canada, cod, hake, coli and halibut in Norway but few of them have ever fought a blue fin tuna and are silent when they hear of the thrilling tales of these fish. Not that fishing for salmon and these other types of fish is not exciting and challenging, but it cannot be compared with fishing for blue fin tuna. 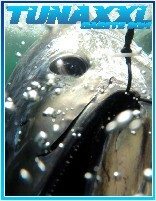 Even an attack on his bait will be something for the angler to remember. 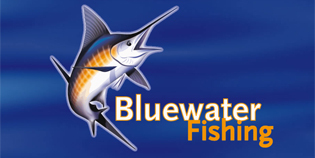 Fishing for bluefins is not for the run-of the-mill angler; it is something for the passionate fisherman who wants action, adrenalin and adventure! 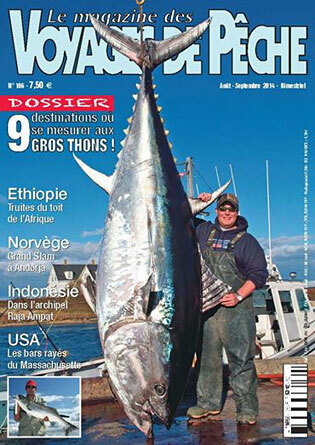 Fishermen who have been out with us on fishing expeditions will never forget the catch of a bluefin. This is a fact and at the same time a promise! Years later stories of the almost unbeatable fighting power and speed of the fish will be told and the light in the eyes of the fishermen speaks volumes.. 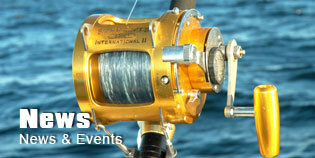 Even those who are not anglers get excited. One cannot describe it - one has to experience it!!! 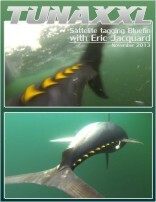 "Fighting a giant bluefin is like you try to stop a moving car with 50 mph." Famous people have been after the blue fin for years. For example, U.S President Franklin D. Roosevelt and Al Capone did not want to miss out on this adventure. Both of them were successful in Nova Scotia on several occasions. One of Al Capone's companions was even nicknamed "Big Tuna" and this was not without reason! 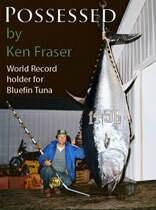 The fact is that the fascination of blue tuna has captured people from every walk of life and will continue to do so. Big Game Fishing in Nova Scotia! anglers for a long period of time; however, now the opportunity is capable, and with TunaXXL we offer you the chance and experience to catch the great big bluefin tuna. Atlantic coast of Nova Scotia.